As a young mom I know how important it is to be healthy, but it doesn't mean I am, as many of us moms are busy that we tend to put our needs aside. I learned the hard way that taking care of my body is not only important for me but so that I am around for my children. I now have a slew of medical problems and I wonder if I had taken better care would I be in this predicament now? Fortunately I am able to control some of my health issues with medications, vitamins and supplements. Being able to get all the essential omegas is incredibly difficult with the way today's way of eating. A lot of us choose convenience over healthy, but fortunately there are products like Nordic Naturals- Ultimate Omega D3 to help keep our bodies healthy. Not only does this great supplement carry the vital omegas but also vitamin D3, which is important for our bone health. We should all know that healthy bones mean less likely to develop osteoporosis. But did you know low vitamin D3 levels can also contribute to depression, back pain, cancer and prenatal problems? 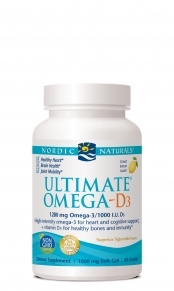 That is why I feel so strongly about the benefits of taking the Nordic Naturals- Ultimate Omega D3. Nordic Naturals carries other great products and more information on omega research that can be found on their website. Now onto some cool news, Nordic Naturals is running a contest called, What’s Essential™. You can enter to win a trip to California and many other awesome prizes along with the trip. I entered even though I live in California already because there are so many cool things to do here and also one of the prizes is a years worth of Nordic Naturals. You can enter the contest here at Nordic Naturals What's Essential contest. Don't forget to read the contest rules. The Contest begins at 12:01 a.m. Pacific Time (PT) on January 1, 2012 and ends at 11:59 p.m. PT on April 30, 2012. You can also find Nordic Naturals on Facebook and Twitter. *Nordic Naturals has given me this product to review. I was not given the product in exchange for a positive review. All opinions are my own.